Last month during our semi-annual PubMetrics presentation (video and slides are available), the most notable digital trend we shared concerned live streaming. When we look at the performance of 179 station streams across the country, we see a bit of good news and a bit of bad news. 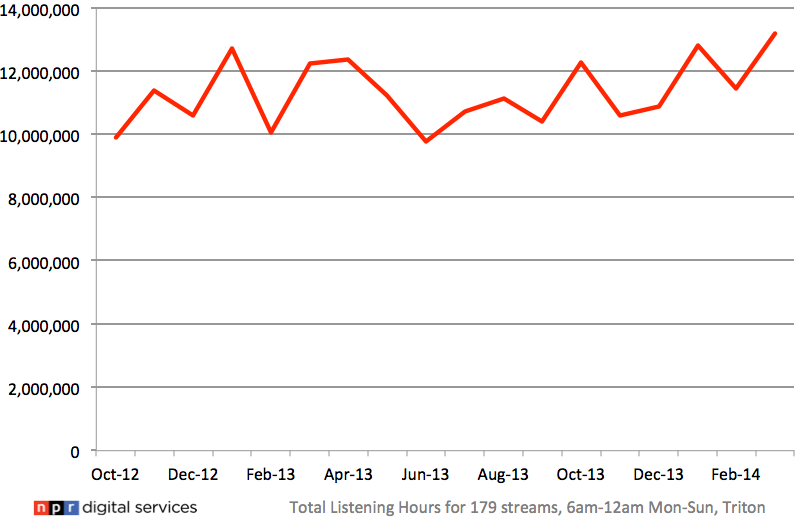 As you can see, Total Listening Hours is rising slowly across the system at a pace of 8% year over year. That's obviously good news, since internal and external research tell us that more and more people are turning to digital platforms for listening. But it's not exactly the stunning increase we might hope for, especially compared to the incredible growth of Pandora on the music side. Where is this growth happening or not happening? When we look deeper, we see that it's the number of sessions that's on the rise, not the length of each session (which is basically flat, at just under 60 minutes per session). If we're seeing more sessions, that means one of two things: Either we're getting more listeners, or existing listeners are streaming a little more often. 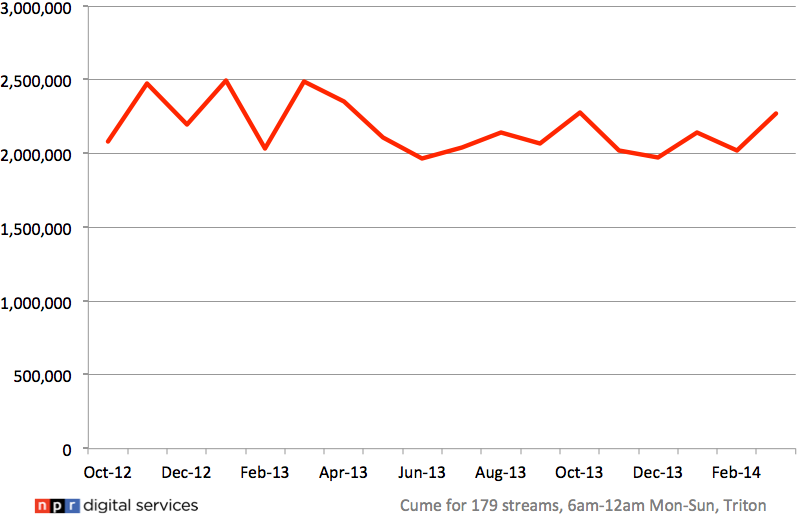 When we look at streaming cume, we see the answer: Unique listeners are actually dropping slightly, 9% year over year. We don't know yet if this is a longer trend or a short-term blip, but even so, it's a surprising warning sign. We lack pieces of the puzzle. Currently, we can't slice this data by platform in Triton Webcast Metrics, so we don't know how much of these trends are happening on station sites vs apps vs aggregators vs other platforms. The good news is that Triton is working on improved reporting that will enable user agent breakouts late this year or early next year. The big opportunity might not be live streams. It's possible that the live streaming experience isn't the best way to attract new audience, and that a more tailored experience using on-demand audio will see better results. NPR One will test this theory. The challenge? There is no system-wide measurement of on-demand audio right now, so we don't know how much growth there is in listening to audio segments, archived programs, and podcasts. The good news is that Digital Services is building this measurement solution right now, so we'll be able to track on-demand listening and fill in the missing pieces. Are we marketing our streams effectively? It's much easier to raise awareness of the text content on our sites. We can push it out via social media, encourage our audience to share it, ensure it's findable on Google, and so on. But we have to work harder to market our live streams. How often do you do this on air? Or on your Facebook feed? What's the most effective messaging to persuade new folks to try streaming for the first time? If organic growth of live streaming is slowing, it's up to us to push on the accelerator. Stay tuned as we track these trends longer term and look for more clues. We all know that digital listening is on the rise. But exactly how much listening is now streaming vs broadcast, and how can you track this over time for your station? To find out, you need to compare broadcast numbers from Nielsen Audio (formerly Arbitron) to streaming numbers from Triton Webcast Metrics. But sadly, these two sources measure things a bit differently, and there are details you need to know in order to compare them accurately. Did you know that approximately 9% of all public radio streaming is happening using TuneIn, one of the biggest audio aggregators? And that TuneIn is seeing faster streaming growth than most public radio stations are seeing on their own websites? These are the somewhat surprising discoveries made recently as we analyzed metrics on hundreds of public radio streams available in TuneIn.